For more than 40 years, Green Chimneys’ day camp has blended great camp traditions with dynamic outdoor experiences to create exciting and educational summers full of memories to last a lifetime. Green Chimneys Summer Camps recognize each child’s individuality and support their desire to discover the world, and who they are in it. This simple philosophy helps to create meaningful summer experiences that keep kids returning year after year. Green Chimneys Summer Camps are fully accredited by the American Camp Association and li­censed by the New York State Department of Health. 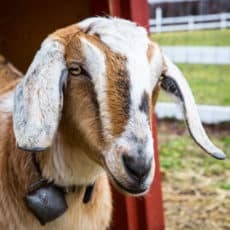 A school that partners children with animals for educational and therapeutic activities is an ideal home for Nutmeg, a Nubian goat donated by a family who kept her as a therapy animal for a child with special needs. Nutmeg arrived at Green Chimneys as an energetic one-year-old. Although she had lived solely with people, she immediately adapted to her new goat peers at the farm. At the same time, she presents a challenge to students: goats possess a strong will so taking a walk is not always a simple task.